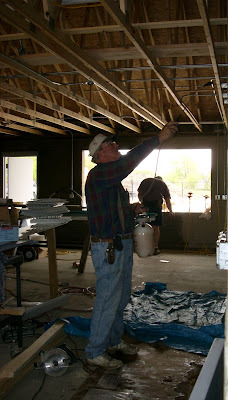 electrical work is progressing on the bathhouse . 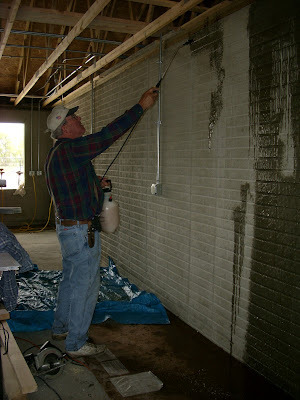 . .
Bob Mueller busy sealing the concrete inside the bathhouse . . .
Bob Mueller with John Mueller in the background almost done sealing the concrete . 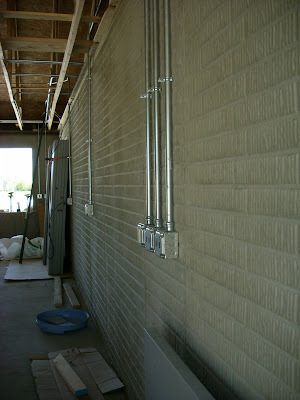 . .
fixtures are going in on the bathhouse and should be completed soon. . . The pool was fenced in this week and lots of progress was made on the bathhouse. 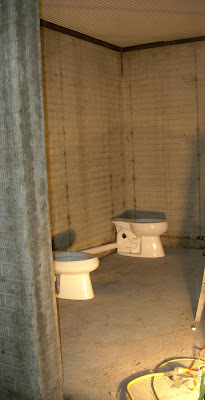 Fixtures were installed and the inside of the bathhouse was sealed. Much of the electrical work is done with lights installed on the outside. The exterior doors have been installed and the pool is currently being painted. Much of the opening will depend on how well the test runs go and how inspections are scheduled.